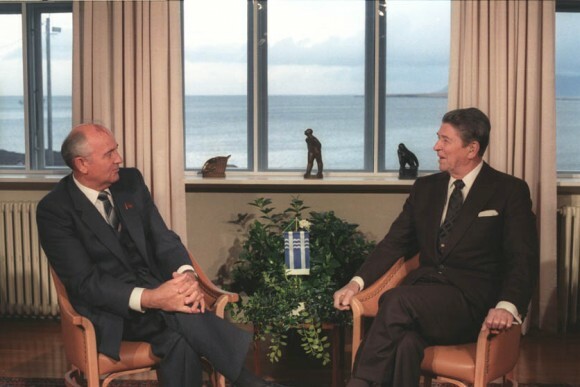 Reagan and Gorbachev at Hofdi House during the Reykjavik Summit in 1986. Ken Adelman has written an appealing, breezy account of the most extraordinary chapter of US-Soviet nuclear negotiations – the impromptu summit at Reykjavik on October 11-12, 1986 between Ronald Reagan and Mikhail Gorbachev. His new book, Reagan at Reykjavik: Forty-Eight Hours that Ended the Cold War, covers familiar ground, but this story never gets old. Adelman adds value with personal detail and notes taken of Soviet preparations for the summit by Anatoly Chernaev. Several of his broad conclusions, however, including that Reagan accelerated the demise of the Soviet Union by sticking to his guns on the Strategic Defense Initiative (SDI), are overdrawn and unsupported by evidence. In these pages, Reagan remains very much a mystery. How can one properly decipher a leader with such instinctual powers and showmanship, but with such a weak grasp of substance and loose grip on his subordinates? Adelman’s narrative intertwines summitry with the Iran-Contra affair. How could the President described in these pages as so far-sighted on nuclear negotiations be so myopic about dealing with Iran? Adelman offers no plausible answers. If Reagan remains so mysterious to those who served him, historians will also be hard-pressed to lend coherence to his presidency. Reagan comes across differently here than in Adelman’s earlier account, The Great Universal Embrace: Arms Summitry – A Skeptic’s Account (1989). The passage of time has made the author less of skeptic and more of a fan of Reagan’s unique style of leadership. He concludes that he is “better able, this second time around, to see his quirkiness and creativity, his personal flaws and stunning foresight, his casual and sometimes careless management but his dogged determination to change America, and then the world.” Adelman ranks Reagan along with Harry S Truman as the bravest and wisest post-World War II Presidents. Reagan was, in Adelman’s apt characterization, America’s “outlier president” — staunchly anti-nuclear as well as anti-communist – a combination previously considered by his admirers and detractors to be absurdly improbable. His opposite number after three ailing Communist Party General Secretaries, Mikhail Gorbachev, was a radical reformer who relished trashing orthodoxy as much as Reagan. Neither superpower had previously been led by anyone willing and able to turn hammer, sickle and eagle’s talons against received nuclear wisdom and force structure. At Reykjavik, both leaders were absolutely eager to do so. During their ten and one-half hours of negotiations, they entertained the complete abolition of ballistic missiles, nuclear weapons, offensive nuclear arms or nuclear weapons – their terminology shifted and lacked precision. They succeeded in dispensing with all but one big roadblock to the complete elimination of missiles with ranges between 500 and 5.500 kilometers, and paved the way toward fifty per cent cuts in strategic nuclear forces. Neither man invited experts at the table to gum up the works; they were accompanied for most of this time only by Secretary of State George Shultz and Foreign Minister Eduard Shevardnadze — who were usually silent — as well as note-takers and translators. Their retinue of experts – a Soviet team led by 63 year old Marshal of the Soviet Union Sergei Akhromeyev and 79 year old Paul Nitze – two compelling figures in their own right – met for one memorable all-nighter to help pull their leaders’ visions closer together. No deals were struck at Reykjavik because Reagan refused to confine his cherished SDI to laboratory testing. Most commentators and media outlets deemed Reykjavik a failure, taking their cues from the drawn faces of the two leaders hastily leaving the summit’s venue, Hofdi House. Others who weren’t party to the negotiations were quite relieved that Reagan and Gorbachev were unable bridge their differences, including those on both sides responsible for maintaining nuclear orthodoxy and force structure, as well as America’s NATO allies, who found comfort in the shade under the U.S. nuclear umbrella. It didn’t take too long for pundits and media outlets to figure out that Reykjavik was an extraordinary success story rather than a failure. A treaty eliminating intermediate- and shorter-range nuclear forces was signed in Washington, amidst much pomp and ceremony, fourteen months later. Before leaving office, Gorbachev welcomed Reagan to Moscow, ground central of the “evil empire” he railed against at the outset of his presidency. (When asked by a reporter during a stroll in Red Square whether the opprobrium still applied, he responded, “No. That was another time, another place.”) The strategic arms reductions that Reagan and Gorbachev envisioned at Reykjavik were finalized in 1991 and 1993, during George H.W. Bush’s term in office. Reagan and Gorbachev broke the back of the superpower nuclear arms race. Reykjavik was the pivot point for this world-historic achievement. The ambition of these two men was breathtaking and contrasts painfully to President Barack Obama’s hesitancy and President Vladimir Putin’s revanchist tendencies. Both Reagan and Gorbachev deserved the Nobel Peace Prize for their efforts and their concrete achievements. One could not have accomplished deep cuts in nuclear forces without the other. But only Gorbachev got the Nobel Peace Prize. Later, in 2009, the Norwegian selectors awarded a Nobel to Barack Obama, attaching “special importance “to his “vision of and work for a world without nuclear weapons.” This irony pales before those at Reykjavik, which were on a Shakespearean scale. Note to readers: This review will appear in The Nonproliferation Review. The second half now appears here. Well, what remaind from Reykjavik?